At the core of poet Robert Schultz and photographer Binh Danh’s art is the power to create empathy from memory. The duo forged their own unique connection in 2006 but didn’t start working together until 2009. 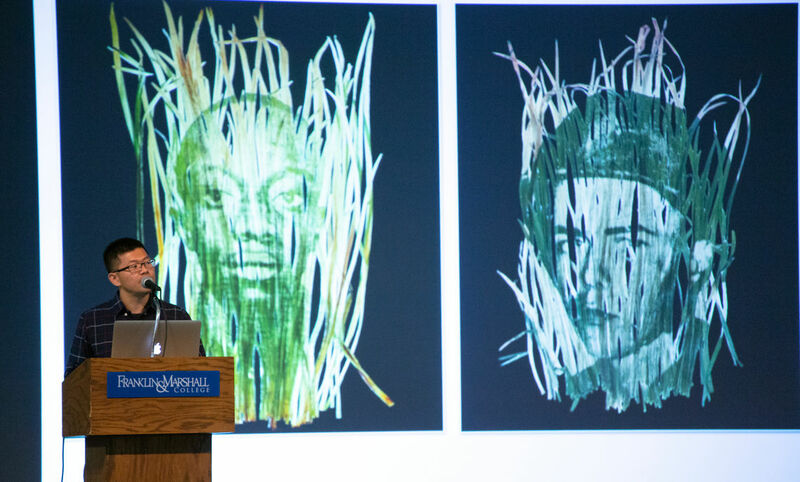 When Schultz first saw Danh’s “chlorophyll prints,” including portraits of victims of the Vietnam War printed on leaves, they instantly brought to mind poems by Walt Whitman. In a specific poem, Whitman philosophizes about how the dead are reborn and renewed each season in the grass and leaves. Schultz gave Danh Whitman’s poetry collection “Leaves of Grass” as a gift, “with post-it notes sticking out of the book—recommended reading from ‘my professor,’” joked Danh. Thus, an artistic partnership was born. The resulting collaboration is the exhibition “War Memoranda: Photography, Walt Whitman, and Memorials,” which is now on view at F&M’s Phillips Museum of Art. Schultz and Danh found portraits of fallen soldiers from the Civil War and Vietnam War, both times that marked moments of great division and loss in America. Using Danh’s chlorophyll printing technique, the portraits were developed on blades of grass and leaves. The resulting pieces are literal and moving embodiments of Whitman’s philosophy. The pair also used 19th-century photographic techniques, such a cyanotypes and daguerreotypes, to capture historic battlefield landscapes. Other works include war poems and prose by Whitman. The two artists think the division in the U.S. during the two wars is reflected in America today, exemplified specifically in last year’s tragedy in Charlottesville, Va. On Aug. 12, 2017, a white supremacist group hosted a “Unite the Right” rally protesting the removal of a statue of Robert E. Lee from Charlottesville’s Emancipation Park. The violence that erupted at the event resulted in the death of a peaceful counterprotester, Heather Heyer, at the hands of a “Unite the Right” supporter. Danh and Schultz believe a better way to memorialize historic moments is by focusing on individual victims of war, the soldiers and others who fell on both sides. That is why they use portraits in their art. Part of their inspiration was the famous 1969 Life Magazine issue, “Faces of the American Dead in Vietnam,” which was filled with portraits of deceased soldiers. 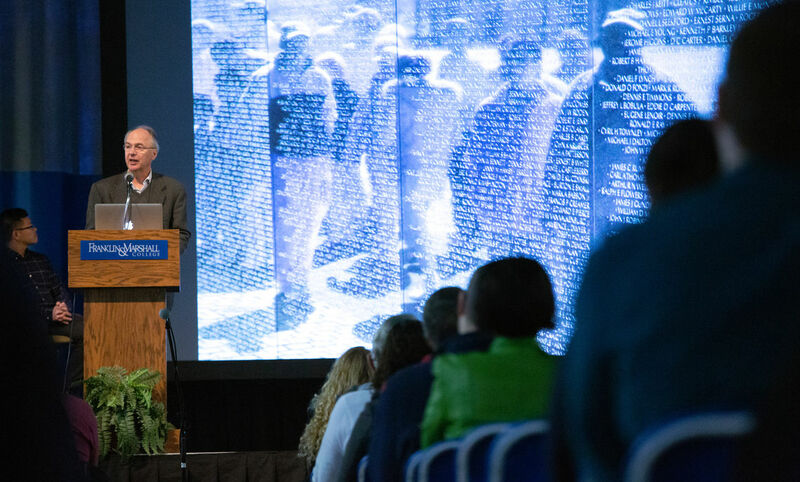 The piece brought a humanity and new level of awareness of the tragedies occurring in Vietnam to the American public, uniting many in opposition of the war. Another inspiration was the Vietnam Veterans Memorial in Washington, D.C., which lists the individual names of the dead.